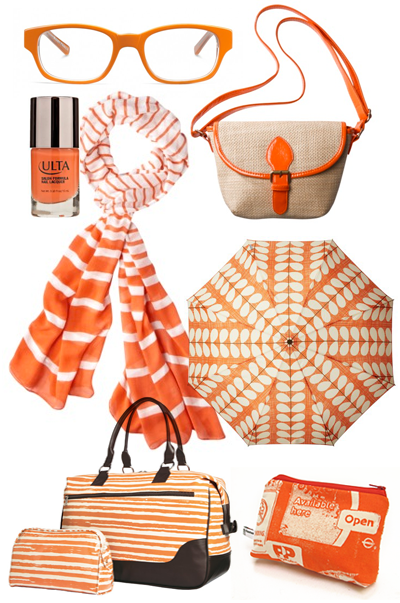 Next up for Orange Week: orange accessories. Glasses, polish, scarf, purse, umbrella, bags, pouch. too cute, I like orange. LMAO!! This should be good for the Dutch during Euro 2012. Those glasses! I love them! I'm married to a baseball fanatic and we live in Baltimore, so dressing in orange is part of my daily life. That purse is amazing and I need that in my closet ASAP!!! I very much agree with the orange umbrella. Love the glasses! I wear glasses and I never thought to do orange ones. Will keep these in mind come prescription time! I'm going to Target tomorrow for that cute purse too! I love all these! I gotta say, my husband has gotten me more and more into orange. Especially when combined with a light light blue. I find myself buying little orange accessories all the time now.